Darkus Knightley has had a problematic few years. His father has lain in an impenetrable sleep — a coma, to all intents and purposes — for the last four years. His mother has remarried, and his stepfather Clive seems determined to dress only in unattractive synthetic shell suits. Meanwhile, his stepsister, Tilly, is the daughter of his father's former assistant Carol, herself the tragic victim of a car accident … or was that murder? So when Darkus finds himself on the receiving end of a mysterious visit from the Department of the Unexplained, and learns his father has reawakened, he's better equipped than most to deal with the news. After all, it's just one more link in a chain of rather extraordinary events. And with his keen intellect, formidable memory, and intimate knowledge of his detective father's former case files, he's probably the best chance the authorities have of stopping the shadowy crime organisation known as the Combination. It's not long before father and son are combining forces to unravel the clues. Could a book known as The Code be at the heart of the latest crime spree? How is the Combination manipulating its victims? Is Chloe, the attractive publishing assistant, really who she seems to be? Will Bogna, the Polish housekeeper, and Uncle Bill, the Scottish undercover agent ever be able to understand each other? And will Tilly keep the same hair colour for more than a couple of hours? With his penchant for tweed and his exceptional deductive skills, Darkus bears more than a passing resemblance to another famous detective, but his flawed relationship with his father saves him from cliché and brings an all-too-human touch to the story of a teenager desperately trying to win his father's approval while fighting crime along the way. This is the first book in a new series. 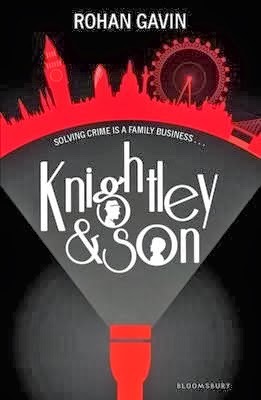 I look forward to more madcap adventures in the company of Knightley and Son.